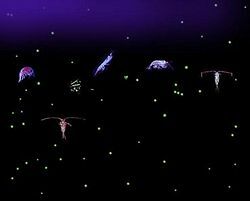 Plankton is the collective name for certain organisms (mostly microscopic) that drift in the oceans, lakes, rivers, and other bodies of water. Plankton have a tremendous importance in the web of life on earth. The name plankton is derived from the Greek word planktos, meaning "wanderer" or "drifter." 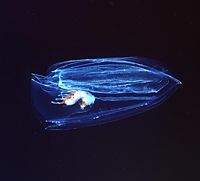 While some forms of plankton can swim, they cannot do so strongly enough to avoid being carried along by the water current. This is in contrast to nekton organisms that can swim against the current and control their position (for instance fish, squid, and marine mammals). It is also in contrast to benthos organisms that live on the bottom of bodies of water (for instance coral, clams, and lobsters). Within the plankton itself, holoplankton are those organisms that spend their entire life cycle as part of the plankton. By contrast, meroplankton are those organisms that are only planktonic for part of their lives, usually the larval stage of fish and other aquatic organisms. Plankton exhibit both the harmony of life and the fragility of our systems. The harmony is reflected in the cycle of energy and carbon via plankton: through photosynthesis, certain plankton capture the sun's rays and carbon, which is then circulated through other plankton and consumers, which in turn passes to decomposing plankton, releasing nutrients back into the water column. Most of the oxygen we breath is produced by photosynthetic plankton in our oceans. However, given the central importance of plankton for energy, carbon, and oxygen cycles, were the delicate balance of the oceans to be irreparably harmed, our own lives could be significantly impacted. The study of plankton is termed planktology. Individual plankton are referred to as plankters. Phytoplankton (from Greek phyton, or plant), use photosynthesis to convert sunlight into chemical energy for life. Zooplankton (from Greek zoon, or animal), feed on the phytoplankton or other zooplankton. Bacterioplankton, mainly decompose the remains of other organisms. This scheme divides the plankton community into broad producer, consumer, and recycler groups. In reality, even the trophic level of some plankton is not straightforward. For example, although most dinoflagellates are either photosynthetic producers or heterotrophic consumers, many species do both depending upon their circumstances. 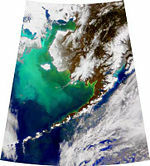 NASA satellite image of the large phytoplankton bloom in the Bering Sea in 1998. The greenish color is caused by the high concentration of phytoplankton. Phytoplankton, like plants, obtain energy through photosynthesis, and so must live in the well-lit surface layer (the euphotic zone) of the ocean. They provide the energy for almost all life in the sea. Cyanobacteria. Cyanobacteria, also called "blue-green algae," are bacteria. They are thought to be the first organisms on earth that developed photosynthesis. They are one of the few organisms that can take nitrogen from the air and "fix" it into organic molecules so it can be used by plants and animals. Diatoms. Diatoms are protists. They are single-celled algae with protective cell walls made of silica. In favorable conditions, diatoms "bloom," reproducing rapidly so that they dominate an area. When conditions turn less favorable, for instance the coming of winter or a depletion of nutrients, they can turn dormant and sink to lower levels until currents return them to the surface and a new bloom can take place. Dinoflagellates. Dinoflagellates are also protists. They differ from diatoms in having a whip-like tail that enables them to move in the water, mostly up and down in response to changing conditions. Dinoflagellates also bloom, which can create a "red tide" in which they release toxins that can kill fish and/or humans who eat shellfish in which the toxins have become concentrated. Those dinoflagellates that do not use photosynthesis but eat other organisms are considered zooplankton. Seaweeds. Although the word "plankton" is most often used for microscopic, or at least very small organisms, seaweeds, which are multi-cellular algae, may be considered planktonic if they drift in the open ocean rather than are anchored to the bottom. Sargassum weed forms huge floating islands in the western Atlantic Ocean that provide a home for many unique animals. Zooplankton are animals or animal-like organisms. They mostly live in the surface waters since they feed on the phytoplankton and on other zooplankton. Copepods. Copepods are small crustaceans, most about 1-2 millimeters long with some larger. They are unusual among animals in only having one eye. Most species feed on the single-celled phytoplankton and are in turn eaten by fish and other larger animals. Krill. 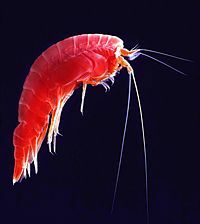 Krill are also crustaceans. Related to shrimp, they are larger than copepods, most being about 1-2 centimeters long. They are sometimes not considered true plankton since they can swim, although they are still carried along by the currents. Most species of krill come together in large "swarms" that contain billions of individuals. They are eaten by many other animals, including many species of whales. There is some commercial fishing of krill, mostly to feed fish in aquariums and aquaculture, but also for human consumption. Jellyfish. Jellyfish are among the largest planktonic animals. Most feed on zooplankton and small fish. Some jellyfish can grow to as large as 2 meters in diameter, with the tentacles much longer. It is suspected that the world's jellyfish population is increasing as their competitors, the large fish, are removed by human fishing. Larva. The larva of fish and other animals such as coral and marine worms are also included in the zooplankton. The larva of the common eel, Anguilla anguilla, looks so different from the adult that is was thought to be a separate species until the 1890s. Bacterioplankton are bacteria which mostly live by decomposing the remains of other organisms, although some are parasites. Cyanobacteria are also bacteria, but they are considered to be among the phytoplankton since they use photosynthesis. Bacterioplankton are found at all levels of the ocean, not just near the surface as are most other plankton. They serve an important purpose of breaking down the remains of other organisms so that their nutrients can be reused, and are also eaten by zooplankton. Some bacterioplankton live near volcanic vents on the ocean bottom where they feed off of chemicals the vent releases into the water. They support a community of other living things which is remarkable among the earth's ecosystems for not depending on sunlight for energy. However, some of these terms may be used with very different boundaries, especially on the larger end of the scale. The existence and importance of nano- and even smaller plankton was only discovered during the 1980s, but they are thought to make up the largest proportion of all plankton in number and diversity. Plankton are found throughout the oceans, seas, and lakes of Earth. However, the local abundance of plankton varies horizontally, vertically, and seasonally. The primary source of this variability is the availability of light. Almost all plankton ecosystems are driven by the input of solar energy and this confines primary production to surface waters, and to geographical regions and seasons when light is abundant. A secondary source of variability is that of nutrient availability. Although large areas of the tropical and sub-tropical oceans have abundant light, they experience relatively low primary production because of the poor availability of nutrients such as nitrate, phosphate, and silicate. This is a product of large-scale ocean circulation and stratification of the water column. In such regions, primary production still usually occurs at greater depth, although at a reduced level (because of reduced light). Studies have shown that the mineral iron (but only in the proper amounts) leads to increased blooms of many (though not all) kinds of phytoplankton. Iron is primarily made available to oceanic phytoplankton through the deposition of atmospheric dust on the sea surface. Oceanic areas adjacent to arid parts of continents thus typically have abundant phytoplankton (e.g., the western Atlantic Ocean, where trade winds bring dust from the Sahara Desert in North Africa). While plankton are found in the greatest abundance in surface waters, they occur throughout the water column. At depths where no primary production occurs, zooplankton and bacterioplankton instead make use of organic material sinking from the more productive surface waters above. This flux of sinking material can be especially high following the termination of spring blooms. Plankton form the basis of almost all life in the sea. They convert the sun's energy into chemical energy, which is passed on up various food chains to support the great variety of ocean animals, including the fish and shellfish that are harvested by humans. Ninety percent of the world's photosynthesis is carried out in the oceans by microscopic phytoplankton, providing the energy for this process. Omori, M., and T. Ikeda. 1992. Methods in Marine Zooplankton Ecology. Malabar, USA: Krieger Publishing Company. Svarney, E. S., and P. Barnes-Svarney. 2000. The Handy Ocean Answer Book. Farmington, MA: Visible Ink Press. This page was last modified on 15 February 2009, at 15:17.